Summary: On September 11, 2001, after the collapse of the World Trade Center, more than a million people were looking to get out of Manhattan. New York City was under attack, and bridges, tunnels, and subways were closed. The only way to escape was by water. When lines for the ferries became miles long, the Coast Guard put out a call for any boat to come help with the evacuation. “If it floated, and it could get there, it got there,” said an engineer who was part of the rescue effort. Wondering if there would be more attacks, the ships and their crews knew they were easy targets, but they courageously sailed on. Some put out sheets with their destinations in New Jersey painted on them. They tried to help the shocked, distraught people who boarded their boats, and then they took them safely across the water. In about nine hours, just under 500,000 people were helped, the largest sea evacuation in history. 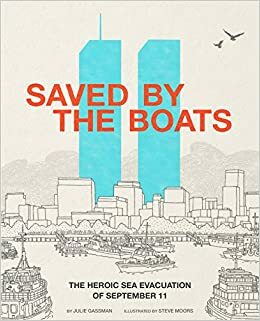 Back matter includes an author’s note telling of her 9/11 experience being rescued by a boat, a brief glossary, and a few additional resources and source notes. 32 pages; grades 3-7. Pros: An interesting and inspiring slice of history, focusing on the courage of the ordinary people who answered the call of duty to help their fellow New Yorkers. The illustrations are mostly sepia toned, with bright spots of color in the sky and water, symbolizing the brightness of the rescue effort on this tragic day. Cons: The glossary (“tragedy—a very sad event”) seemed superfluous for the intended age group. This one has to join my personal library.